El Certificado Energético ya es una realidad. El procedimiento básico para la Certificación Energética ya ha sido aprobado en el Consejo de Ministros en el Plan de Vivienda 2013-2016. Únicamente nos faltan la aprobación en las Cortes. Hoy -Día 05/04/2013- En la rueda de prensa posterior al Consejo de Ministros, la vicepresidenta ha indicado que el nuevo Plan de Vivienda 2013-2016 y los reales decretos para regular el procedimiento básico para la certificación de vivienda y modificaciones de instalaciones térmicas de los edificios se enviará a las Cortes para su tramitación de urgencia. Se anuncia una inversión de 2.500 millones de euros en los nuevos programas de vivienda, de los que 1.500 millones irán destinados a facilitar el acceso a la vivienda y otros 627 millones a la rehabilitación y eficiencia energética. Según el resumen de la rueda de prensa tras el Consejo de Ministros aportamos los siguientes datos más relevantes en el ámbito de la Certificación Energética. El certificado energético una realidad necesaria. Aunque ya conocíamos de “rumores” los presentes datos, ahora ya son una realidad necesaria y muy esperada desde el sector de la construcción. Certificado Energético para comprar o alquilar. La norma establece que a partir de 1 de junio de 2013 será obligatorio poner a disposición de los compradores o arrendadores de edificios o de parte de los mismos, para alquileres con una duración superior a cuatro meses, un certificado de eficiencia energética (Certificado Energético). Este certificado, además de la calificación energética del edificio, deberá incluir información objetiva sobre las características energéticas de los edificios, y, en el caso de edificios existentes, documento de recomendaciones para la mejora de los niveles óptimos o rentables de la eficiencia energética del edificio o de una parte de este, de forma que se pueda valorar y comparar la eficiencia energética de los edificios, con el fin de favorecer la promoción de edificios de alta eficiencia energética y las inversiones en ahorro de energía. Como herramienta para facilitar la obtención de dichos certificados, por mandato del Ministerio de Industria, Energía y Turismo y del Ministerio de Fomento, el IDAE ha elaborado los programas informáticos CE3 y CE3X, ambos publicados como Documentos Reconocidos y guías a disposición de los técnicos certificadores. Obligaciones para las Administraciones Públicas. No hemos podido acceder al Documento del Procedimiento Básico para la Certificación Energética que se enviará a las Cortes para su tramitación urgente con la finalidad de estudiarlo a fondo, pero desde luego es una noticia muy importante y bienvenida desde un sector tan castigado como es el de la construcción. Además se plantean muchas otras iniciativas y ayudas referentes a la Rehabilitación que se contemplan en el Plan de Vivienda 2013-2016. Empieza a tener su relevancia la frase “Eficiencia Energética” y “Ahorro energético”. 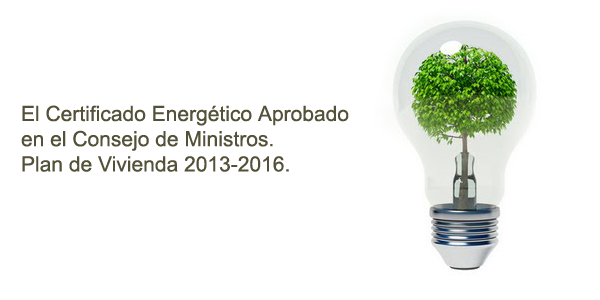 ← Recopilatorio de principales Organismo Oficiales en Eficiencia Energética a nivel mundial. certificado energético como el verdadero impulso que se le pretende dar a la rehabilitación energética y al ahorro de energía. El sector de la eficiencia energética no acaba de despegar en España y este puede ser el espaldarazo definitivo. When I first saw this title Certificado EnergÃ©tico aprobado & on google I just whent and bookmark it. What i don’t realize is actually how you are not really a lot more neatly-liked than you might be now. You are very intelligent. You know thus significantly relating to this topic, produced me for my part believe it from so many various angles. Its like men and women are not involved until it is something to do with Girl gaga! Your individual stuffs great. All the time take care of it up! When I first saw this title Certificado EnergÃ©tico aprobado & on google I just whent and bookmark it. An impressive share, I just given this onto a colleague who was doing a little analysis on this. And he in fact bought me breakfast because I found it for him.. smile. So let me reword that: Thnx for the treat! But yeah Thnkx for spending the time to discuss this, I feel strongly about it and love reading more on this topic. If possible, as you become expertise, would you mind updating your blog with more details? It is highly helpful for me. Big thumb up for this blog post! When I first saw this title Certificado EnergÃ©tico aprobado & on google I just whent and bookmark it. This is getting a bit more subjective, but I much prefer the Zune Marketplace. The interface is colorful, has more flair, and some cool features like Mixview’ that let you quickly see related albums, songs, or other users related to what you’re listening to. Clicking on one of those will center on that item, and another set of “neighbors” will come into view, allowing you to navigate around exploring by similar artists, songs, or users. Speaking of users, the Zune “Social” is also great fun, letting you find others with shared tastes and becoming friends with them. You then can listen to a playlist created based on an amalgamation of what all your friends are listening to, which is also enjoyable. Those concerned with privacy will be relieved to know you can prevent the public from seeing your personal listening habits if you so choose. When I first saw this title Certificado EnergÃ©tico aprobado & on google I just whent and bookmark it. About Dress Shirts … Would this possesses anything to use the weather or maybe Forex Signal Providers ? Fantastic place though! When I first saw this title Certificado EnergÃ©tico aprobado & on google I just whent and bookmark it. Thank you for sharing superb informations. Your web site is so cool. I’m impressed by the details that you have on this web site. It reveals how nicely you understand this subject. Bookmarked this web page, will come back for extra articles. You, my friend, ROCK! I found just the information I already searched everywhere and simply could not come across. What a perfect web site. I dugg some of you post as I thought they were extremely helpful very useful. I very lucky to find this web site on bing, just what I was looking for 😀 as well saved to favorites. Hello There. I found your blog using msn. This is a very smartly written article. I will make sure to bookmark it and return to learn more of your helpful info. Thank you for the post. I will definitely return. Some truly fantastic info, Glad I found this. I genuinely enjoy looking through on this site, it contains excellent content. Keep up the good piece of work, I read few content on this website and I think that your web blog is very interesting and holds circles of good information. I wanted to check up and let you know how , very much I valued discovering your web blog today. I’d personally consider it a honor to do things at my company and be able to utilize tips provided on your web site and also take part in visitors’ comments like this. Should a position involving guest author become available at your end, make sure you let me know. Some really prize articles on this website, saved to my bookmarks. hi!,I really like your writing very a lot! share we communicate more approximately your post on AOL? I require an expert in this area to solve my problem. May be that is you! Looking forward to peer you. I was just searching for this information for some time. After 6 hours of continuous Googleing, finally I got it in your website. I wonder what’s the lack of Google strategy that don’t rank this kind of informative sites in top of the list. Usually the top websites are full of garbage. you’re actually a excellent webmaster. The web site loading velocity is incredible. It kind of feels that you are doing any unique trick. In addition, The contents are masterwork. you’ve performed a fantastic process on this topic! I would like to thnkx for the efforts you’ve put in writing this site. I am hoping the same high-grade web site post from you in the upcoming also. In fact your creative writing abilities has encouraged me to get my own web site now. Really the blogging is spreading its wings rapidly. Your write up is a good example of it.